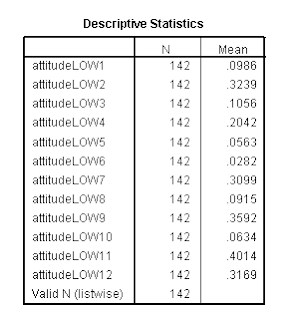 The following post sets out how to present a table of descriptive statistics for a set of items using SPSS, Excel, and Word. At the bottom of the post, I've got an example of doing it in R.
Finney, S. J., Pieper, S. L., & Barron, K. E. (2004). Examining the psychometric properties of the Achievement Goal Questionnaire in a general academic context. Educational and Psychological Measurement, 64, 365-382. The aim is to provide means and percentages of participants choosing specific response ranges. 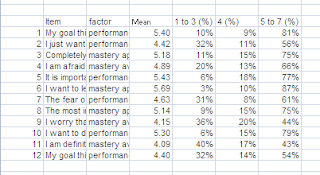 This format is is similar to that used at my own university when reporting quality of teaching scores. A table is provided where each row contains a survey question and columns are provided for the mean, and percentage of respondents agreeing (options 4 or 5) and disagreeing (options 1 or 2) with each item. A useful property of providing both the mean and the percentages is that each provides a useful way of thinking about the overall pattern of responses. Percentages are often easier to interpret intuitively. The example has 12 items with variable names attitude1 to attitude12. Each item is on a 7 point scale. 1. calculate variables to represent groups of response options. My aim is to report the percentage of respondents reporting 1 to 3; 4; and 5 to 7.
xLOW = attitudeLOW1 to attitudeLOW12. IF ( x = 1 OR x = 2  OR x = 3)  xLOW = 1.
xMID = attitudeMID1 to attitudeMID12. IF ( x = 4)  xMID = 1.
xHIGH = attitudeHIGH1 to attitudeHIGH12. IF ( x = 5 OR x = 6  OR x = 7)  xHIGH = 1. The syntax above should be run. It will create three new sets of variables with a value of 1 if the respondent answered one of the target values (e.g., 1, 2, or 3 for low) and 0 otherwise. To learn more about DO repeat in SPSS, check out some of these links (University of Washington, SPSS, UCLA). To modify the above syntax for your own needs, alter the variable names and numbers. And alter the focal response values (e.g., for a five point scale, you might have x = 1 OR x = 2 for low, 3 for mid, and 4 OR 5 for high). 2. 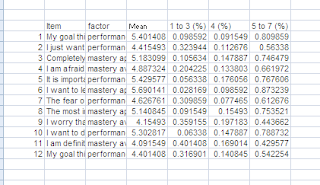 Get the mean and percentage in each category for each item. The above syntax will provide the output. 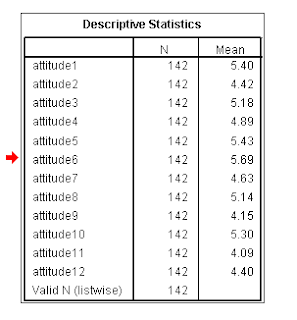 You could alternatively use the menus and go to Analyse - Descriptives - Descriptive Statistics. (b) Add Item Number and Item Text (and optionally the factor that the item belongs to). e.g., for the means, control+1 brings up cell formatting; then numbers 2 decimal places was selected for the mean; percentage with 0 or 1 decimal place might be useful for the categories.